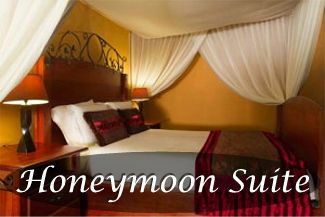 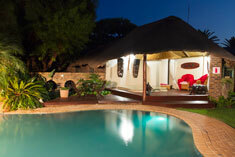 Cruiser Safaris South African safari hunting lodge accommodations. 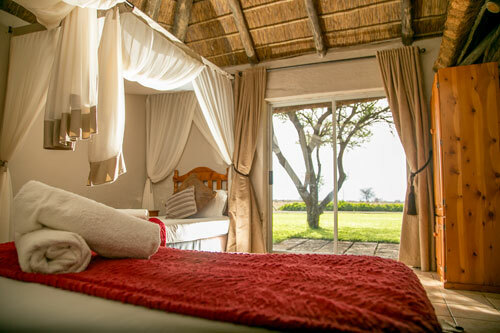 At Cruiser Safaris your safari hunting accommodations won't include staying in a tent in a hastily constructed camp, but rather the comfort of first class thatched roof chalets. 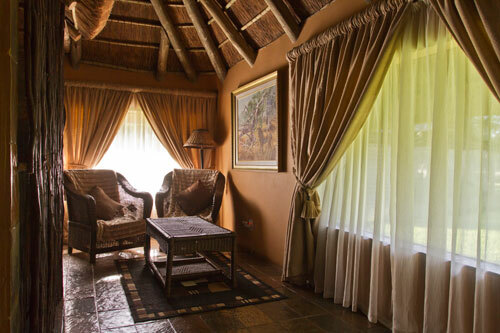 All chalets are equipped with hot and cold running water, flush toilets, comfortable beds, electricity, all linens and towels and hot showers. 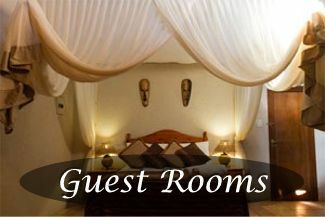 We take pride in our accommodations, cuisine and our personal service. Our safari camp is staffed with experienced personnel eager to cater to our clients every need. 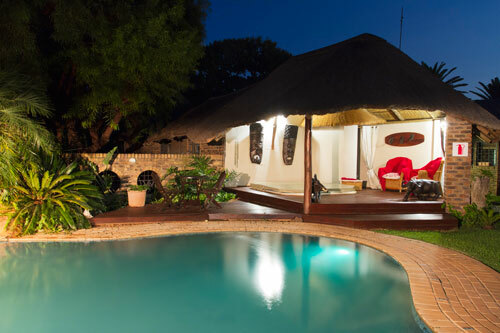 You will enjoy a bushveld setting with beautiful gardens landscaped with local trees and plants and a man-made waterfall will add to the ambiance. 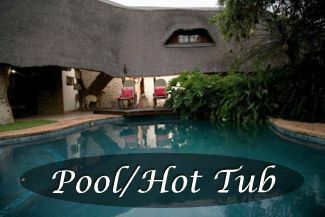 The accommodations at our hunting camp include a deluxe swimming pool and a Hot Tub which offers a relaxing setting and on those warm days an excellent opportunity to just take the time to refresh yourself. 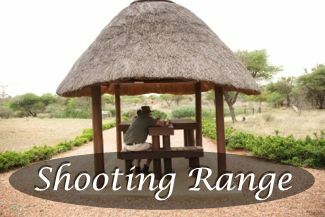 Our camp also has an outdoor sitting area to curl up with a good book or to just take advantage of the surroundings and you will appreciate relaxing in the Boma (fire pit area) to relive all of the exciting moments of the day. 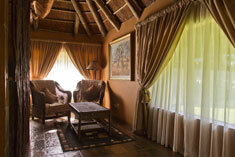 Dining and lounge areas are under traditional South African thatched roof architecture. 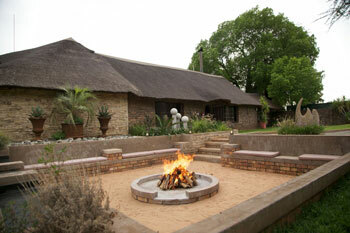 You can see a video for our lodge and area on our Videos page. 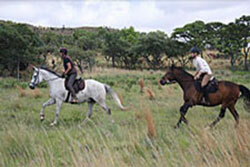 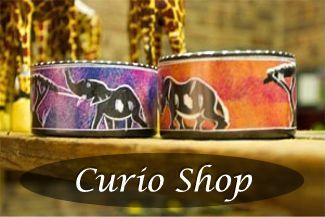 Also visit Cruiser Safaris TV - YouTube. 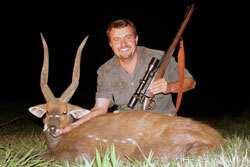 Don't plan on losing weight on your hunting safari with our Chef, Delmarie in the kitchen! 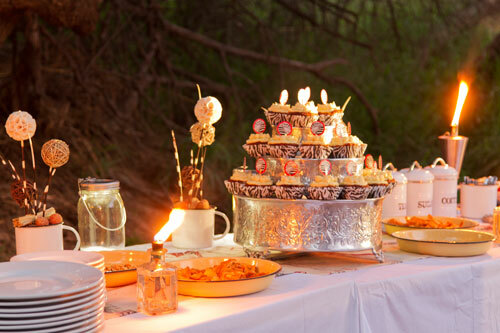 In camp you will be able to sample game and traditional South African dishes, or our Chef will serve any dish you would like prepared to perfection! 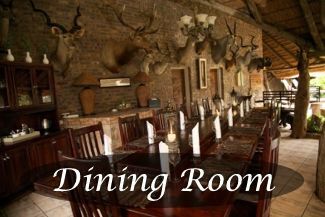 All meals are nutritious and elegantly presented with plenty of fresh produce, fine wines and deserts that will have you going back for seconds. 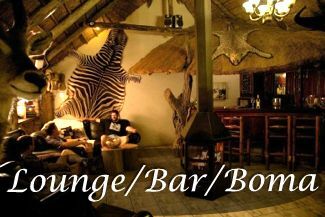 Upon booking your safari, you will be sent a form in which you can indicate your food preferences and/or any special dietary needs. 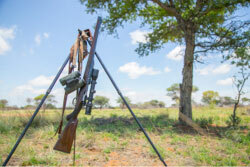 We understand that after a good days hunt there is nothing better than to relax and talk over the events of the hunt. 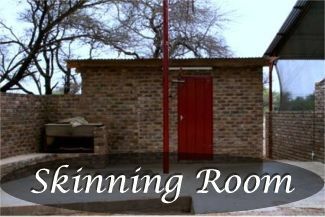 When you return to camp each evening you will be at your leisure to freshen up and change clothes if you so desire. 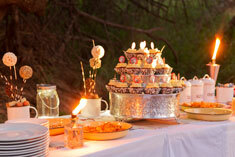 You will then find plenty of hors d'oeuvres and a well stocked bar for your enjoyment. 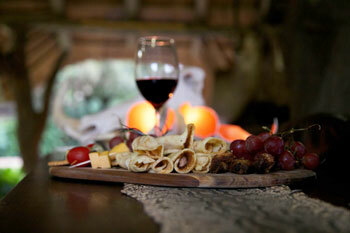 Gather around a roaring fire, exchanging stories and the experiences of the days hunt before your elegant evening meal. 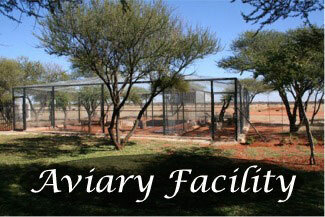 Click on the images below to view photos of our listed facilities and amenities.